﻿ COMPANY_HEBEI BROTHER HAO PLASTICS PRODUCTS CO.,LTD. Hebei Brother Hao Plastics products Co.,Ltd. is a large-scale manufacturerspecialized on flexible transparent PVC strip and PVC sheets etc which established in 1993.Our company located in Dacheng County Area,Hebei Province. 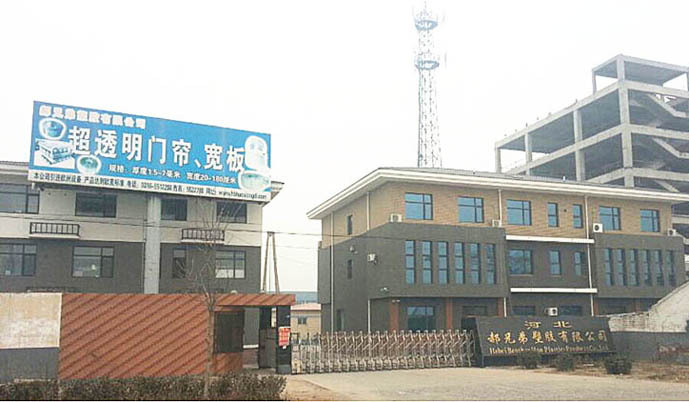 After more than 20 years development,Hebei Brother Hao’s team developed into a notable supplier of PVC extruding solution with full chains from Research,Production and Sales. Nowadays,our team’s fixed assets capital is more than 8 million US dollars,our factory area is more than 20000㎡,equips with 15 PVC extruding lines,especially 5 lines utilize the most advanced extruding technique,we can produce PVC strip curtain and flexible PVC sheet which are derived from oiling and sticky problems caused by traditional extruding technique,meanwhile we have made an astonishing achievement on PVC rolls’ transparency problem,now our PVC rolls have been awarded as”crystal ball”in PVC extruding field. based on strict quality control and environmental compliance,Brother Hao’s products have been well received by worldwide customers.our marketing scope including China Mainland,Asia-Pacific Region,Europe,Middle East Asia and Africa,our distributors located more than 100 countries and regions. From the first day of foundation,our company insists of “Honesty is first” as our company’s policy of developing and operating.we sincerely welcome all customers from any regions and countries to contact with us or visit our company, based on mutual benefit we hope to build and maintain close relationship with all of you.